Metro Rail Transit I think it was made for shoppers and Mallers! The Metro Rail Transit (MRT) or Metrostar is the latest of the light rail transit’s in Manila. It actually runs along the Epifanio delos Santos Avenue, more commonly referred to as EDSA, with the station from Taft Avenue ending in North Avenue. Other stations after Baclaran Station are EDSA Station, Magallanes Station, Ayala Station, Gil Puyat/Buendia Station, Guadalupe Station, Bonifacio Avenue Station, Shaw Blvd. Station, Ortigas Station, Santolan-Annapolis, Araneta Center Cubao, Camuning Station, Quezon Avenue Station and North Avenue Station. 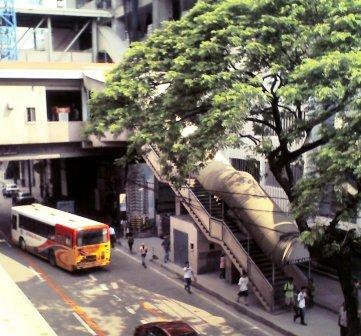 What is wonderful about the Metro Rail Transit Stations is that they are connected to or adjacent to Shopping Centers in Manila. In fact, if going to the malls is what you want, then you should definitely take the Metro Rail Transit. Beginning at the Taft Avenue Station you can take a less than 5-minitue jeepney ride to the famous Mall of Asia , the biggest mall in the Philippines and fourth biggest mall in the world. In fact there is a direct shuttle from the various stations to the mall. Then there is also the Ayala station which is also connected to the conglomerate of shopping centers in Ayala, like the Glorietta, Greenbelt and Landmark. Since Ayala is in Makati, it is also one of the easiest ways of going to the business district. Further along is the Shangri-La Plaza connected at the Shaw Blvd station. And beside the Shangri-La Plaza is the SM Megamall. After Shaw Blvd. you have the Ortigas Station where you have again another mall, the Robinson’s Galleria. If you are going to SM Megamall you can also take the Ortigas Station since it is in between the two stations. Now if you are going to another shopping destination, the Shopesville Greenhills and Vira Mall, then you can take a jeepney ride from the Ortigas station or take off from the next station, the Santolan-Annapolis station. There you have jeepneys that will take you directly to Greenhills. Next comes the Araneta Center Cubao where the station is also connected to another mall, the Gateway. 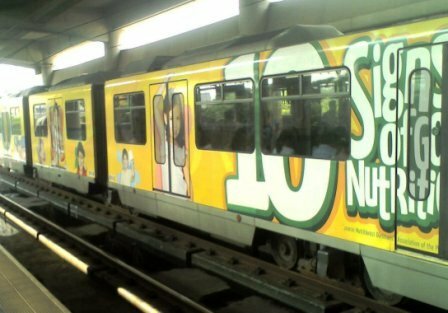 Lastly, at the North Avenue station is the Trinoma Mall and the SM City North. Now you might think that the Metro Rail Transit was built to please the shopping addicts but actually the stations are well placed to connect travelers to the major areas of the different cities. The stations from Taft Avenue to North Avenue actually run across the cities of Pasay, Makati, Mandaluyong, San Juan, and Quezon City. Now if you are going to the City of Manila, you can get off at the Araneta Center Cubao Station and take the LRT2 (connected in station), this will take you as far as Recto, Manila. From there you can take a jeepney or the LRT1 to the different places of the City of Manila. As for the ride itself, it is quite enjoyable except during rush hours and I mean hours! Although it is elevated, there are elevators and escalators if you do not want to take the stairs. It is also quite safe, with many security personnel around and bomb sniffing dogs. Bags of passengers are also inspected for additional security. Do you know where you are staying yet? Have a look here for hotels in Manila that I have stayed at and reviewed. Have a look here for other ways of getting around the Philippines.